Stock is a nutritious base ingredient made from what is often discarded. The collagen from the cartilage and connective tissue and the calcium from the bones are vital to our bodies functions. Long slow cooking of these parts releases these nutrients into the broth and using the broth in soups allows the nutrients to be delivered to our joints and bones. In days of old, it was not uncommon to have a stock pot constantly simmering. As stock was used more ingredients and water would be replaced. Simmering meat stock over the open fire. Clay pots are excellent vessels for simmering on an open fire. 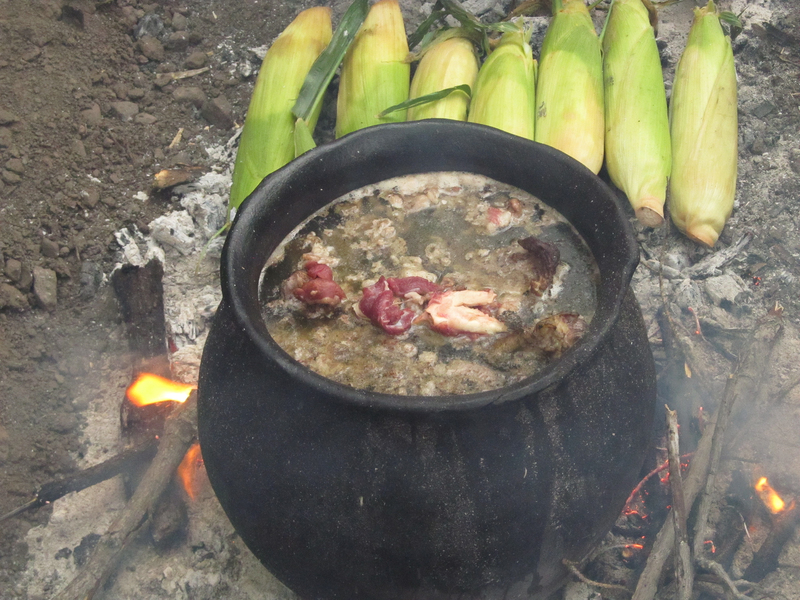 Place bones in the pot with enough water to cover. Bring to boil and then simmer for 3 hours. Remove the bones from the stock and let cool for 10 to 15 minutes, then remove the meat from the bones. Cool and store this meat. Crack the any large bones such as the leg bones. Return the bones to the stock add any vegetable scraps. Return the stock to a boil then reduce the heat until the stock just barely simmers. Periodically add water so that the bones remain covered. Cook the stock for another 6 to 36 hours depending on available time. Remove the bones from the stock. Strain off the stock into another vessel. Discard the dregs since they may have bone shards. The stock is now ready for use or may be cooled and stored for later use. More recipes from the Animal Processing Workshops. Learn More about the Animal Processing Workshops.